Online hashtag becomes series of walk outs at high schools across county protesting racism. On Wednesday night, Hispanic students at Tigard High School celebrated the end of the school year with a special celebration for graduating seniors. On Thursday afternoon, those same students marched out of their classes in protest. 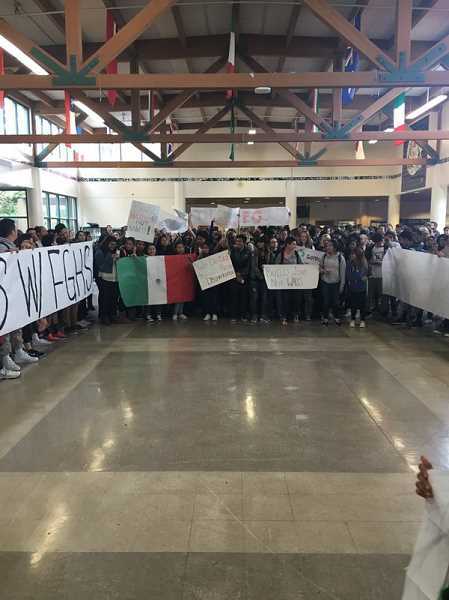 Students at Tigard and Tualatin high schools walked out of class on Thursday, May 19, in solidarity with a walkout at Forest Grove High School regarding racism on campus regarding racism on campus regarding racism on campus. 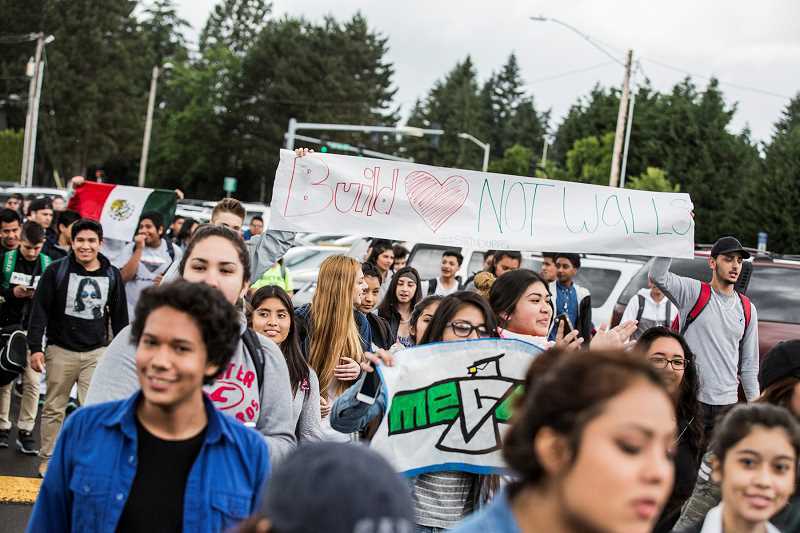 Forest Grove High School students protested after a sign reading Build a Wall was hung by a student inside the school on Wednesday, May 18. Several hundred students marched, chanted and sang through the streets, sparking a wave of similar protests at schools across Washington County coordinated on social media as #StandUpFG. In all, students at about a dozen schools across the county walked out of classes to show their support for Forest Groves student body. Sherwood High School students are planning to hold similar demonstrations on Friday, May 20, according to student organizers. The three-word banner, which was hung in the school cafeteria, was seen as a message against Hispanic students, particularly Mexican-American students. Presidential candidate Donald Trump has called for a wall to be built along the United States' border with Mexico. At Tigard and Tualatin high schools, hundreds of students walked out of classes. Tualatin High students braved heavy rain as they marched along Boones Ferry Road and Ibach Street, some carrying banners with slogans like Brown Pride and Build Love Not Walls. They cheered as cars passing by honked in support. Tigard High School students held a short impromptu rally inside the schools commons, before returning to class. Students of all races joined in the Tigard and Tualatin marches. About 19 percent of Tigard High Schools student body is Latino. At Tualatin, that number is higher, at about 23 percent. Brenda Perez, a sophomore at Tualatin High who marched with fellow students up Boones Ferry Road during the walkout, said she doesn't expect the march to change issues with racism at her school. I don't think it will change much with the racism in general, but maybe our administration will take a notice of how involved we want to be in our community, she said. Asked whether she has experienced racism at Tualatin High, freshman Olivia Sammond nodded. There's not as much as other schools, but there is some, she said. One student, who declined to give The Times his name, came out to the fence at the edge of the Tualatin High campus to observe the march. He said he didn't know about the walkout beforehand. I saw a Mexican flag, and I was like, 'We aren't in Mexico,' he said. He said he did not support the demonstration, arguing that Trump's position on the Mexican border should not be considered racist or anti-Mexican. However, he added, he would have participated in a march against Democratic presidential candidate Hillary Clinton. Teachers and administrators at both Tigard and Tualatin high schools expressed their support of the students rights to peacefully assemble, even if it did disrupt an otherwise routine Thursday afternoon. Tualatin High Principal Darin Barnard was among several school staff members who greeted students as they returned from their walkout, many clearly exhilarated despite being soaked. He said staff wanted to support students' right to express their feelings. Versus fighting kids and holding doors, 'No, don't go anywhere,' let's do (the walkout) under as controlled an environment as we can to support the kids, and make sure they're safe, number one, and that they get back to school, Barnard explained. Van Fleet said that Tigard High administrators learned of the demonstration only an hour before it began and worked to make sure the students voices were heard, while maintaining a regular school day. While the banner at Forest Grove High School might have been inspired by the ongoing presidential election, Van Fleet told Pamplin Media Group after the demonstration that students were supporting one another and standing up against racism, not necessarily taking a political stand. Editor's note: This story has been updated with more quotes and information about the Tualatin High School demonstration and with corrected information about planned demonstrations at Sherwood High School.